Vivaldi 1.14 is out. The new version of the web browser features a vertical reader view and usability improvements for various built-in features. 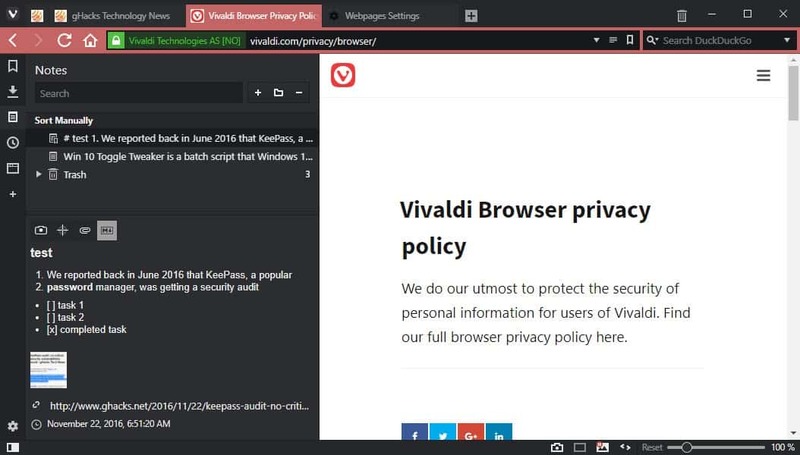 Vivaldi Technologies AS launched the first preview version of the Vivaldi Browser three years ago in January 2015, and the first stable version in April 2016. Vivaldi released a total of 14 stable versions of the web browser at that time introducing features such as theme scheduling, native screenshot capturing, animation controls, and a lot more. Vivaldi's Reader View is an excellent feature. It improves the readability of articles on the Web by removing distracting elements such as navigational elements, menus, sidebar content or advertisement. Reader View supported customization options for some time. Users may change font type and size, line height or column width, and switch between light and dark designs. Vertical Reader View adds support for languages such as Japanese, Korean or Chinese (simplified and traditional) that may use a vertical display for written text. 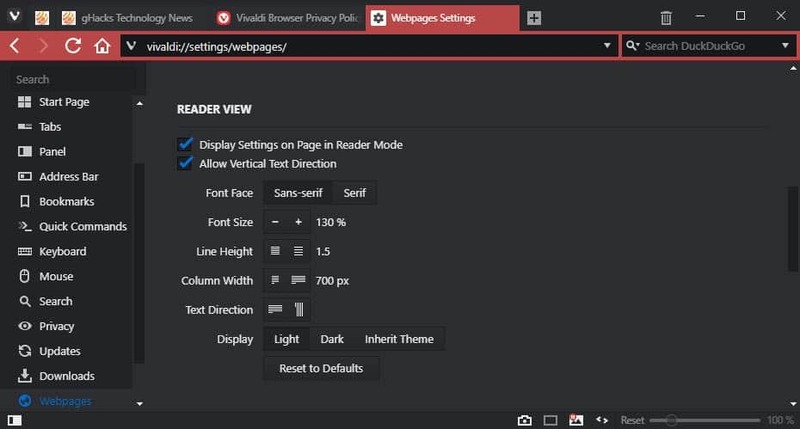 Vivaldi is the first web browser to support a vertical reading mode. Load vivaldi://settings/webpages/ in the browser's address bar. This displays the WebPages Settings page. Scroll down to the Reader View section. Check "Allow Vertical Text Direction." Select the "vertical text" icon under Text Direction. Note: This changes the default text direction for all languages. Vivaldi 1.14 has no options to assign the text direction to specific languages so that the text direction applies automatically based on a page's language. You may flip the text direction when in Reader View mode, however. Vivaldi users may take notes using built-in functionality. Notes is a handy feature to write text notes, copy text from web pages, take screenshots, and attach files. Notes supported plain text only up until now, but this changes with the release of Vivaldi 1.14. Notes support markdown as of the release which means that you may apply formatting to your notes. Check out GitHub's help page for additional commands. 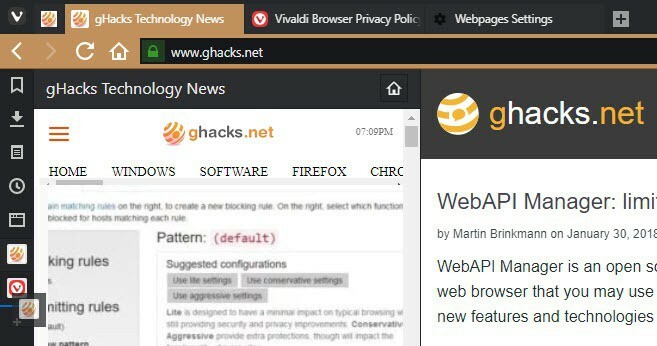 Vivaldi users may drag and drop websites to the sidebar to make them web panels. This opens a selected site in the sidebar area of the browser so that it may be accessed from there and without impacting the page of the active tab in the process. You may rearrange the order of Web Panels in Vivaldi 1.14. Use drag and drop to move any site pinned as a Web Panel in the browser to another location. Note that the order of built-in panels is fixed and that you may only change the order of Web Panels. 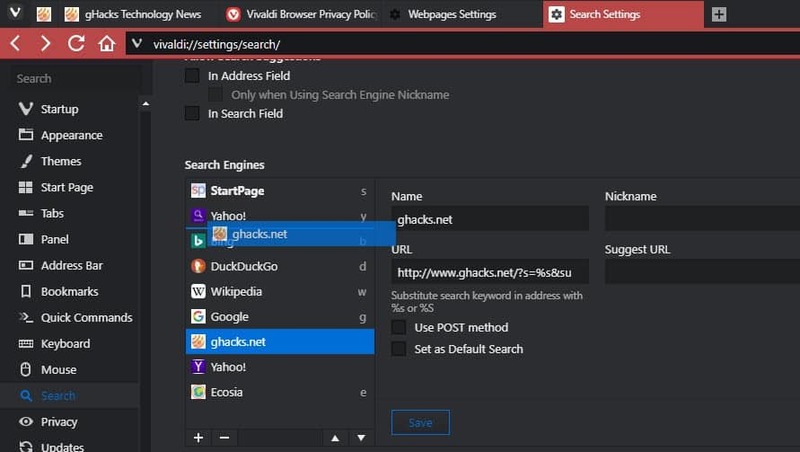 You may change the order of search engines similarly to how you can change the order of Web Panels in Vivaldi 1.14. Open the Search settings (vivaldi://settings/search/) and drag & drop search engines around on the page that opens. A click on the down arrow icon next in the browser's search toolbar displays the search engines in the selected order. Tip: use keywords, e.g., b search term or s search term in the address bar to run searches using specific search engines. Vivaldi 1.14 may not reinvent the wheel but it introduces new or improved features that will certainly appeal to part of the browser's userbase. I'm particularly excited about markdown support as it makes note taking that more powerful in the browser. Now You: Have you tried Vivaldi recently? What's your take on the new version? Can someone who has experience with both give me a comparison Vivaldi vs Opera please? @Ivan: Opera is quick, stable, less annoying than Chrome, feels mature, and is very optimised for battery life. I have found Vivaldi interesting and promising, but there are lots of niggles and slight incompatibilities with websites. More importantly, Vivaldi is the worst browser regarding battery usage and CPU impact – I presume due to a less-optimised codebase or just the fact that its devs are more focused on introducing new functionality. Agreed in principle. However, Vivaldi is known to be a battery hog on various platforms according to many tests, reviews and comparisons I’ve seen over the years. Battery consumption is difficult to judge, but not when it comes to Vivaldi. Pretty much every metric has indicated that the browser is the worst among the “major” browsers available. It’s worse than FF Quantum, Edge, Safari, Chrome, Opera, even Brave. Which is understandable since it is a very feature-rich browser that forgoes adding features via extension, to instead bake them into the browser itself, but Vivaldi is definitely not a browser for those with computers with low RAM (it eats it up) or who prioritize battery life (again, it eats it up). Well to be fair, Vivaldi has more features than other Chrome clones so it will use more resources. I agree that Opera is faster than Chrome. Also, you can install extension without going through Chrome store. Vivaldi feels more like Presto-based Opera than current Blink-Based Opera does; it has more customization settings, and despite of allegations regarding users tracking from last days offers IMO more privacy than backed by Chinese business Opera which seems to be aiming at milking users data in same fashion as Firefox does. Vivaldi was started as wikipedia states by: Opera Software co-founder and former CEO Jon Stephenson von Tetzchner and Tatsuki Tomita. So both browsers are in some way related to each other. Both are technically Chrome/Chromium clones and neither had any advantage over other on my machine in term of stability or memory usage. I would put here Brave as third alternative but without access to Chrome extensions by default, ideas about supporting sites by money and/or virtual cryptocurrencies it’s not a choice at all for regular users – more for blinded enthusiasts (sadly). Please provide some prove to the state that Opera is undermining the user privacy cause they were bought by a chinese company. Currently they run under the law of Norway and Poland. It is quite annoying that people are claiming the same thing again and again under every Opera related article. A good release, but most of the linux versions got held back due to incompatibilities with the operating system’s older codec versions. They said that this would be resolved within a few days. And one thing that always bothered me is how vivaldi://settings is full of… settings. Yeah, I know that’s exactly their intention but I don’t like it, having a settings panel full of options just confuses me. I rather prefer the Firefox approach of having the basic settings in about:preferences, and advanced settings via about:config. That’s funny as I have the exact opposite view: After Firefox Quantum I have 100% interest in Vivaldi. I’m now an ex-Ff user. In a way, I’m pleased that Mozilla did what it did, because that forced me to look for an alternative. I.M.H.O, Vivaldi is way better than Firefox. Vivaldi’s “quick” bookmark still takes 2 clicks. Unacceptable. In Opera when you click on a folder in the bookmark bar, you can hover through the other folders. In Vivaldi you have to click again and again. Quite annoying in Vivaldi. Vivaldi is quite nice, too bad it is Chromium in the end.